Once a landfill, Freshkills Park is said to become one of the largest parks in New York City spreading over 2,200 acres. The development of this park is a massive and very challenging undertaking for the New York City Department of Parks &Recreation (DPR). The very first phases of this project are already underway and will open to the public in 2011, however, it will take another 30 years to successfully transform the existing landscape into a green space. The design of the Draft Master Plan, Freshkills Park: Lifescape will guide and shape the future site that will become a safe and beautiful park. The park is going to be established as a natural setting with open spaces along with recreational amenities and attractions such as horseback riding, mountain biking, kayaking, trails for hiking, bird observation tower, as well as art and cultural programming. The New York City Department of Parks & Recreation is offering free bus tours for the people who wish to experience, at first-hand, the site and learn about the future projects. I hope this change will create new and wonderful opportunities for the residents of Staten Island to enjoy. 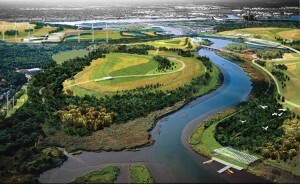 Learn more about Freshkills Park on it’s official site.